When most people think of a "Pirate Coat", the vision that they conjure up in their minds is really what is known as a "Justaucorps". The French word translates to English as "to the body" or "right on the body" (although, it's modern meaning is - leotard.) The justaucorps was fairly well established by the beginning of the GAoP (for sake of argument, lets say 1680). The early justaucorps is a fairly straight forward garment; coloarless, long to the knee or more with minimal skirts at the side, low slung pockets, and lots of buttons. By the end of the GAoP, it becomes the fashionable item of choice with full skirts and form fitting curves. 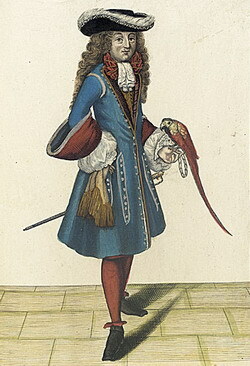 In Marcellus Laroon's The Cryes of the City of London drawne after the life, originally published in 1687, we already see the justaucorps being worn by the lower classes of English society, though lacking the fancy materials and trimmings of the upper classes of the time. Norah Waugh describes the early Justaucorps in her book The Cut of Men's Clothes as simple cut, with 2 fronts, 2 backs with straight side seems that were stitched to just below the waist where the skirts were left open to allow for the wearing of a sword. The neck had no collar and the sleeves are wide and reach to the elbow where they turn back to form the cuff. 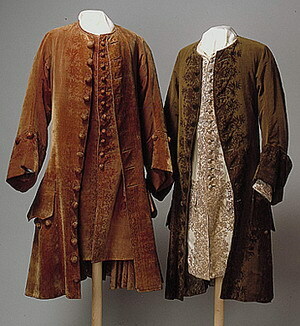 As the coat progresses toward the 1690s, it gets a little more "elegant". There is more shaping around the arms and on the back seam, and more form fitting to the sleeves. The cuffs now have a few different styles such as the long and narrow "hounds ears". There is a wide variety in the styles of pockets with the earlier justaucorps, some even with multiple, vertically set pockets. Often the pocket decoration is repeated on the sleeve cuffs. Fashionable gentlemen might be dripping with ribbons and trimmings at this point. 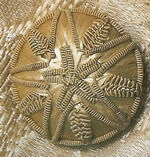 Seams are often hidden under trims or braiding, and buttons can be "passementerie", which are wooden moulds covered with silver or gold wire or threads, or more simple with fabric covered wooden disks. For lower class clothing, the buttons seem to be made by covering wooden disks with the same fabric as the coat, or making little "balls" or "screws" of fabric and sewing them up in little pouches of the coat material. As we move closer to the turn of the century, we see the shaping around the armholes, closer fitting sleeves, and the general increase of volume of the coat. By around 1700, we start to see the side skirts arranged in pleats, and 1720ish, the front line is "swung off the straight" and the skirts are maximized to take all possible space. In the first quarter of the 18th century, the style of pockets "standardizes", taking a scalloped appearance, and they are now set in line with the tops of the side pleats. The pockets, while functional, are not seen "buttoned" even though they have buttons and buttonholes. The sleeves of the coat seem to go to about mid forearm (or at least, not to the wrist) and the cuffs are wide and deep and cut as separate pieces. The cuffs are turned backed and held in position by buttons. Buttons, again either cloth or passementerie seem most common, would go from the throat all the way down the body however the button holes below the waist (and down the back vent) are "fake" in the sense that the button holes are stitched but not cut. The materials used for the lower classes were more than likely wool, or type of linen. For the upper classes, brocade silks, fine linen, high quality wools etc. This coat is described in A Henshall and S Maxwell's Clothing and Other Articles from the late 17th Century Grave at Gunnister, Shetland. The "Gunnister Man" was found in a peat-bank in 1951. Archeologists believe that he had possibly died from exposure in the winter and was buried by the side of the road. The artifacts found with the body date it to the late 17th Century, which makes a perfect study for us in the style of clothing that was available and worn by the working classes during the GAoP. 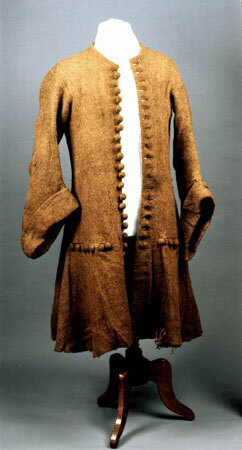 The coat has the typical collar-less design of the period though the neck area is faced on the inside. There are 20 functional buttons, made of wool covered wood, that are spaced roughly 1" apart down the front of the jacket to below the waist. Four additional buttons below the functional ones are paired with "fake" button holes (stitched, but uncut). The pockets are aligned with the the 19th button from the top, which places it slightly below hip level. These pockets are 7 inch horizontal slits that are faced on the insides, but both are sewn closed. Each pocket has 7 buttons (again wool covered wood). The pocket buttons have corresponding "marked" buttonholes, but they are not worked and, only the ones in the center are cut. The coat is made from heavily milled and felted wool. The color is a blend of brownish colored Shetland fleeces that give it an overall khaki color. The weave is a 2/2 twill. wool.